ECONOMYNEXT – Sri Lanka’s top business groups have called on the island's political rulers to ensure due process and the Rule of Law and condemned violence by lawmakers in parliament. “We are deeply concerned about the current political situation in the country,” said a joint statement by the Ceylon Chamber of Commerce (CCC), International Chamber of Commerce Sri Lanka (ICCSL), Joint Apparel Association Forum (JAAF) and The Women’s Chamber of Industry & Commerce (WCCI). The ongoing political crisis is very damaging to the economy, they said. We are deeply concerned about the current political situation in the country. It is our view that the executive and the elected representatives have a duty to ensure that decisions are taken with regard for due process and the Rule of Law. The events of the last few weeks have resulted in absolute instability which is a situation that Sri Lanka simply cannot afford. This will no doubt hinder development and have a significantly adverse impact on the social and economic trajectory of our country. It is observed that the entire administration of this country has come to a standstill and the public officers are paralyzed being unable to discharge their functions. The ultimate victims are the people of our country. We recently witnessed the most unacceptable and abusive behavior displayed in the Chamber of the Sri Lanka Parliament. The conduct of some of the elected representatives was both shameful and an embarrassment to our country. We call upon all those responsible to accord the highest priority to national interest and refrain from pursuing any path that will result in an economic downfall which will have an adverse impact on the country and the people. We call for urgent and sensible action. ECONOMYNEXT – Sri Lanka’s government could reduce risks associated with repaying forein loans by going for longer term borrowings, Moody’s rating agency has said amid a political crisis triggered by the sudden appointment of ex-President Mahinda Rajapaksa as Prime Minister by President Maithripala Sirisena. Moody’s said that uncertainty about the direction of future policy following the recent political crisis could have a large and lasting negative impact on international investors’ confidence. The crisis could undermine Sri Lanka’s ability to refinance forthcoming external debt at affordable costs, it also said. Sri Lanka's large external financing needs and substantial foreign currency government debt raise its vulnerability, Moody’s Investors Service said in a new report. External payments due over the next year are materially higher than foreign exchange reserves, the rating agency said in its 2019 Global Emerging Market Outlook report. The government’s gross borrowing requirement of about 16%-20% of GDP and significant foreign currency borrowing on commercial terms also make Sri Lanka sensitive to external financing conditions, it said. “Lengthening average government debt maturities mitigate this risk,” the report said. The crisis was triggered when President Maithripala Sirisena replaced Prime Minister Ranil Wickremesinghe with former president Mahinda Rajapaksa last month. AFP - Sri Lanka's political crisis descended into farce Thursday with MPs throwing punches and projectiles in parliament, a day after voting the disputed prime minister out of office and leaving the country without a government. Meanwhile, police said tens of thousands of people took part in a rally in Colombo in support of Ranil Wickremesinghe, whose sacking as prime minister plunged the Indian Ocean nation into turmoil almost three weeks ago. "It was difficult to make out immediately who was hitting whom, but several were hurt, but not seriously," an official in parliament told AFP. "The speaker adjourned the House till tomorrow (Friday)." The official said an MP from toppled premier Mahinda Rajapakse's party injured himself trying to rip out the speaker's microphone and had to be taken to hospital with a bleeding hand. On October 26 President Maithripala Sirisena fired Wickremesinghe as prime minister and replaced him with Rajapakse, Sri Lanka's divisive and seasoned political bruiser. Two weeks later, Sirisena dissolved the strategically important Indian Ocean nation's parliament and called snap elections for January. However, these moves were suspended by the Supreme Court on Tuesday pending an investigation. Day-to-day administration in Sri Lanka remains paralysed as the crisis drags on. Parliament reconvened on Wednesday and lawmakers approved a motion of no-confidence in what they called Rajapakse's "purported" cabinet, also passing motions declaring Sirisena's moves illegal. Thursday's routine parliament session, the first since Rajapakse and his disputed administration were deposed, began with the speaker announcing that the country now had no government. "As of now, there is no prime minister, no cabinet ministers and no government in Sri Lanka," said Karu Jayasuriya, wearing his black and gold robe. "I do not recognise anyone as prime minister." The vote ousting Rajapakse and the Supreme Court's rulings were a major boost to Wickremesinghe. The four-time prime minister, popular with Western countries for his economic reforms, had refused to leave his official residence after being fired by the president. Wickremesinghe's party was also staging a mass rally in the capital later Thursday to demonstrate his public support. Hundreds of supporters were being bussed into Colombo for the rally, party officials said. Addressing parliament Thursday as an ordinary member, Rajapakse asked the house to end the crisis by holding a national election. "Let's go for an election. We want an election, a general election," Rajapakse said. But Wickremesinghe's party immediately moved a resolution rejecting Rajapakse's call and demanded a vote that triggered angry protests from legislators loyal to Rajapakse and Sirisena. Sirisena, who is vested with constitutional powers to induct a new prime minister and a cabinet of ministers, was yet to take note of Wednesday's no-confidence motion. On Thursday he accused Jayasuriya of violating legislative traditions, saying the signatures of 122 legislators who opposed Rajapakse had not been certified as genuine and also pointed to a typographical error. "We don't need to submit signatures to the President. All he has to do is take notice of the resolution passed by parliament. 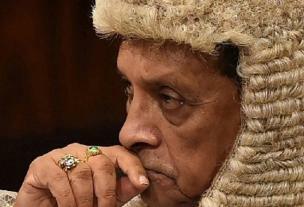 He need not be a proofreader," leftist lawmaker Bimal Ratnayake said. The president also rejected the position that he did not have the power to sack Wickremesinghe and replace him with Rajapakse. The crisis has alarmed the international community. Germany's ambassador Joern Rohde‏ tweeted on Thursday that it was a "bad day for democracy in Sri Lanka... reading about throwing objects at the speaker and preventing votes is unbecoming of a democracy." "There is political and economic instability. Our international image has been badly damaged," Jayasuriya told Sirisena in a letter released to the media. ECONOMYNEXT - Sri Lanka's parliament has amended a no-confidence motion against Mahinda Rajapaksa removing reference to gazettes issued by President Maithripala Sirisena. Speaker Karu Jayasuriya arrived in parliament under heavy police security, and took a voice vote as Rajapaksa loyalists ran off with the speaker's chair they were sitting on. He asked for a proposal on amending an original motion of no-confidence motion against Mahinda Rajapaska passed earlier in the week. Opposition leader R Sampanthan said amendment changed the motion, and once against re-affirmed that parliament had no confidence in him. Patali Ranawaka said the amendement also resolved that the cabient of ministers stood dissolved under the constitution. Speaker Jayasuriya carried on the vote, surrounded by a police cordon using a wireless mike. United National party legislator Gamini Jayawickreme Perera said he was hit with chillie water in the altercation. JVP Legislator Vijitha Herath said he was hit with a copy of the constitution leaving him with a split lip. ECONOMYNEXT - Sri Lanka's President Maithripala Sirisena said he will not suspend the parliament under any circumstances. "I urge all Parliamentarians to uphold principles of democracy parliamentary traditions at all times," he said in a statement. "I will not prorogue the Parliament under any circumstances." His call came as legislators loyal to Mahinda Rajapaksa occupied the speaker's chair engaged in noisy protests and blocked the arrival of the Speaker Karu Jayasuriya. AFP - Sri Lanka's parliamentary speaker had to be escorted into the chamber ringed by police Friday as violence broke out for a second day, with lawmakers throwing chilli powder and furniture in the melee between rival factions in the island’s constitutional crisis. The Indian Ocean nation has been paralysed since October 26 when President Maithripala Sirisena sacked Ranil Wickremesinghe as premier and replaced him with former strongman Mahinda Rajapakse. Speaker Karu Jayasuriya was blocked from taking his chair for almost an hour by a group of legislators and was only able to take his place after he entered the assembly ringed by unarmed officers and parliamentary staff. They then tried to shield Jayasuriya as supporters of Mahinda Rajapakse, who lost a vote of no confidence as prime minister on Wednesday, pelted him with books and stationery. MPs broke furniture and attacked officers and some Rajapakse loyalists were also seen throwing chilli powder at rival legislators and police. Gamini Jayawickrema Perera, a legislator from ousted prime minister Ranil Wickremesinghe's party, said chili mixed water was thrown at his face and he later required treatment in the parliament's medical centre. On Thursday punches were thrown in parliament, deepening international concern with the German ambassador to the island nation saying it was "unbecoming of a democracy". Day-to-day administration in Sri Lanka remains paralysed as the crisis drags on. Sirisena on Thursday asked parliament to amend and re-submit the no confidence motion. On Thursday MPs moved another resolution against Rajapakse, this time to reject his call for snap elections. This is an easy-peasy, elementary effort of an ordinary citizen to comprehend the mad scramble for power among the political class. It is undertaken in the belief that the crisis we face is an opportunity to reject the family kleptocracy of Mahinda Rajapaksa and the corporatist kleptocracy of Ranil Wickremesinghe. We must treat President Maithripala Sirisena kindly. We the people promoted the man beyond his capacity. For three years we were either complicit in or were indifferent to the quiet build-up of a pseudo presidential persona that depicted him as staggeringly successful beyond his worth. Any person with a cursory understanding of the Freudian theory of personality – that of id, ego and super ego will forgive him for his present day penchant to exude an atrocious arrogance that far exceeds his achievements. That NM’s virologist nephew Tissa Vitharana has been bitten by the loony virus is a subject for another day. We often make the mistake of interpreting the polarisation of a few and select power groups or political parties as reflecting a great polarisation of society as a whole. For example, Mahinda does not represent Sinhala Buddhist opinion. He has most of the Sangha in his wallet. We confuse the two. Mahinda gave diplomatic passports to prominent Buddhist monks. For the life of me, I do not understand why Buddhist prelates need privileged passports to preach the Dhamma either here or abroad. The positive side of the current madness is that there is a discernible polarisation of forces between the modern and the tribal. The principled stand of political formations representing ethnic minority interests with enlightened democratic segments of the ethnic majority is a sign that at long last the seeds of a true post-colonial nation state are taking root in the fertile soil of freedom and human dignity. Let us go back to 8 January 2015. The rainbow coalition had a simple objective. It rejected a state that was a kleptocracy and a state that sanctioned murder, abductions and disappearances. More than the kleptocracy part, the fear and excesses of the deep state transcended all other societal fault lines communal, economic and ethnic. The successor state that was installed by the good governance enthusiasts did not sanction murder, abductions and disappearances. But the kleptocracy remained intact. It was far too entrenched. The successors were far too greedy to make the structural reforms that would make a difference. The story of SriLankan Airlines, the bond boondoggle, and legal gymnastics of two President’s Counsel in the Ranil Wickremesinghe Cabinet to stall the probe on Avant-Garde bounty hunters are eloquent examples of the double dealings of the reformers. In the past three years, State-sanctioned murders have not been conclusively resolved. The parents of the eleven youth who vanished while in the custody of the navy are hoping for closure in vain. The Admiral who shielded one of the prime suspects dressed in his grandiose white is exuberantly celebrating his proprietorial grip on the allegiance of a peasant mind incapable of discerning the thin line separating perfidy and patriotism. That said, this worrisome situation should not make us sceptics about democracy. The outcry, the tangible consensus against these problems as mentioned above and not mentioned due to space tell us that that there is indeed something about democracy that is worth mobilising for. At this moment of democratic peril, we must resolve to reinvent and expand our democracy. We don’t need to elect buffoons who after elections pander to the whims and ideocracies of ‘Mahanayakes’ cocooned in their tribal enclaves. The purported Minister of Buddha Sasana according to today’s news reports has agreed with the prelate of Asgiriya monastery that we must not allow foreigners to interfere in our affairs. May be Gammanpila wants the Australian investor to remain mum on his charge of stock market swindle. Our democracy begins and ends with the nebulous notion of an electoral representative democracy. It relies on quite valuable but extremely brittle set of institutions, which cling on to the notion that the elected Political class somehow know better than their electors. The elected parliamentarians and in this instance our elected president does not seem to have much faith in the citizens’ capacity to make political decisions. The challenge we confront is simple and straight forward. We must somehow survive this crisis and form a credible caretaker government and hold a general election in which we the people can decide on representatives who will offer alternative practices enabling genuine democratic participation. The great war hero is exposed in all the nakedness of a cat burglar stealthily stealing the expressed will of the people. Caught with the goods, he has now turned witness for the prosecution and wants a general election. Thanks to the President’s puerile and precipitate action we have an opportunity to rethink and reframe our idea of democracy. There is no way we can restructure it. We must at the next general election, put forward a constitutional model that does not promise but guarantees equality, freedom and the space for ordinary citizens to have a meaningful influence on politics. We must reject both, neo liberal economics and free market economics. Markers need intervention by the state. There is nothing vulgar about State Owned Enterprises, provided the vulgar are kept out of management. It is an urgent and immediate task. I live in Battaramulla. Every day I pass the edifice that houses the Ministry of Megapolis Development now taken over by the charlatan son of Philip Gunewardene, father of the revolution that never arrived. I must make an effort to avoid a monstrous billboard with an obscene picture of Dinesh Gunewardene and call for the Boralugoda lion roar. The task of rethinking our democracy is pressing. We are now witnessing the brazen, arrogant and aggressive attempt by a gang that openly attempted to hijack the Parliament to take command and control of the ‘language of democracy’ to capture power and restore their rent seeking ministerial privileges. They involve ‘The People’ to subvert opposition to their machinations. The recent capture of State media institutions demonstrate their capacity to offer more undemocratic solutions to real and imagined problems. They seek to divide our society on parochial lines and undermine the climate of reconciliation that was clumsily but determinedly pursued in the last three years. You must remember how Mahinda Rajapaksa set up the family business. Mahinda Rajapaksa is not a selfish man. He institutionalised the exploitative privileges and perks of his team from base to the top of the pyramid. Despite his great charisma, this episode has made him a political clown. He has paid a high price. He has lost all political legitimacy. This is the beginning of the end of the Mahinda Rajapaksa folk legend. Now we must focus on our President whom we elected as the common candidate. His humility and his humble life trajectory were his USP – ‘the unique selling proposition,’ the term used by professional marketeers in marketing FMCG – Fast-Moving Consumer Goods – the stuff that has a limited shelf life. In fairness we must remember that he was proud of his achievement or destiny. At some point he concluded that he himself singlehandedly reached the hybrid of an Abraham Lincoln and Nelson Mandela. That is beside the point. He certainly has a deep-seated antagonism towards Ranil Wickremesinghe, the UNP Leader, who paved way for him to become president. The problem is that halfway through they both got confused. The President stopped being grateful. His Prime Minister never ceased crying over his spilt presidential milk. When the President complains about the cultural chasm between him and the Prime Minister, my conscience dictates me to agree with him. First, Ranil Wickremesinghe does not speak the Sinhala that Maithripala Sirisena speaks. Second, no matter how humble you are, there is a limit to tolerating the uppity know all attitude of Ranil Wickremesinghe. It is not an act that is human possible unless your fate, interest or wellbeing is dependent on the UNP Executive Committee. Since defeating the no confidence motion against him, Prime Minister Ranil Wickremesinghe did not bother to mend fences. Newspapers periodically reported that the President got mad over some Cabinet paper or other. In high pressure politics, getting mad over something is not unusual. Staying mad with somebody with whom you have fundamental differences is also not unusual. Getting mad is no big deal. Going actually, really and truly mad is catastrophically insane. ECONOMYNEXT - Sri Lanka's President Maithripala Sirisena had asked for another no-confidence vote against Mahinda Rajapaksa using a name call, or electronic voting, in the wake of two motions that were passed with a show of hands. Supporters of Rajapaksa, ripped up furniture, electronic items and threw them at the speaker, who was protected by a police cordon, during the last vote after occupying the speaker's chair. Sirisena had called on legislators to avoid violence. President Sirisena had also had a telephone conversation with United National Party leader Ranil Wickremesinghe, whom he had refused to re-appoint as PM, reports said. AFP - Crucial talks to resolve a power struggle in Sri Lanka failed to break the political deadlock, officials said Sunday, as the three key players met for the first time since crisis erupted last month. The Indian Ocean nation has been paralysed since October 26 when President Maithripala Sirisena controversially sacked the prime minister and replaced him with a former rival, Mahinda Rajapakse. Deposed premier Ranil Wickremesinghe insists he is still prime minister, and parliament voted twice last week to reject Rajapakse as leader. In a bid to resolve the crisis, Wickremesinghe and Rajapakse both went to meet the president at his office in the capital Sunday for what were widely regarded as crucial negotiations. All three men were at the Presidential Secretariat building for nearly two hours with their aides and party seniors -- but failed to end the political deadlock. Wickremesinghe has demanded his government be restored, challenging Rajapakse to demonstrate a majority in the 225-member assembly. But brawling erupted in parliament Friday with Rajapakse loyalists smashing furniture, throwing chilli powder and launching projectiles at rivals in a bid to disrupt a no-confidence motion against him. Rajapakse's party has admitted that they lacked a simple majority in the legislature. Their rivals accuse them of delaying a vote because they do not yet have the required number of MPs. "He (Rajapakse) must submit himself to a floor test," said Lakshman Kiriella, an MP from Wickremesinghe's United National Party. "Otherwise he cannot run a government." Kiriella said the United National Party and their allies have twice demonstrated that they had 122 legislators -- nine more than the 113 required to demonstrate an absolute majority. Rajapakse's legislator son Namal confirmed the talks had failed and said they would press for the snap election which was called by Sirisena on November 9 -- though later suspended by the Supreme Court until it determines the legality of an early vote. "We reiterate our call for a general election so that people can decide who should be their government," Namal Rajapakse said on Twitter. Sirisena said the parties agreed on Sunday to ensure the peaceful conduct of parliament when it meets again on Monday afternoon. According to his office, the president called Sunday's meeting "in order to end the current political unrest and conflict situation and to allow the normal functioning of the parliament". Wickremesinghe has said Sri Lanka needs "stability" and that he is ready to work with Sirisena, despite the personality clash that triggered the constitutional crisis. After sacking Wickremesinghe on October 26, Sirisena initially suspended parliament and dissolved it on November 9. The legislature only reconvened on November 14 after the Supreme Court overruled his action and demanded a full hearing. For 19 days, Sri Lanka had two claimants to the prime minister's post -- but on Thursday parliament speaker Karu Jayasuriya held that he would recognise neither as premier, leaving the country suspended in constitutional crisis. Officially, Sri Lanka no longer has a government. Legislators say that with the administration at a standstill, key sectors such as tourism are taking a serious battering. ECONOMYNEXT – Speaker Karu Jayasuriya resisted ordering police into parliament on Friday, but changed his mind 42 minutes after being denied entry into the chamber by an aggressive mob of MPs who occupied his desk and chair. Official sources said the 78-year-old Jayasuriya was offered a specialized Special Task Force unit trained in anti-hijacking and hostage rescue operations to clear the way for his entry into the House accompanied by the mace. But Jayasuriya refused the offer, hoping that over 40 legislators of the Joint Opposition supporting Mahinda Rajapaksa would end their agitation and allow the assembly to go ahead with an amended no-confidence motion against the former president. Sirisena had wanted parliament to get the motion passed as it was evident that Rajapaksa had failed to muster a majority in the assembly in the past three weeks. With pressure from Sirisena to ensure a fresh vote, Jayasuriya was faced with the prospect of a physical confrontation and his own security staff advised him not to enter the chamber as JO members appeared to be extremely hostile. By this time, the JO MPs had ripped off the Speaker’s public address system and also occupied the desk of parliament secretary general and other staff. Rajapaksa family members were in the House, but watched the spectacle without getting near the Speaker’s now invaded space. Two parliament employees walked ahead of a posse of policeman making a human chain. Behind a dozen of them walked Speaker Jayasuriya in his black and gold robes and carrying a wireless microphone, a pair of headphones and some papers. He was ringed by the serjeant-at-arms and his staff as well as more unarmed police. The authorities decided on the number of police to enter the chamber after taking a headcount of the belligerent MPs. TRhe constables included a few women too. “The protesting MPs were matched one-for-one by constables,” a source involved in the process said. “Due to the unrest in the chamber, I hereby inform you that I have granted permission to the police to enter the chamber," Jayasuriya said even as rioting MPs were throwing projectiles at him. Kurunegala MP Johnston Fernando grabbed the normal office chair two parliament staffers carried for the speaker to sit on. Johnston broke the chair by dashing it on the ground and used the broken pieces to attack the speaker and the police. A constable was wounded in the neck when a nail from the broken chair hit him. The seat and the backrest of the chair came apart, but police quickly grabbed those two pieces and used them as make-shift shield to protect themselves and the speaker from further missiles. Another JO MP was seen throwing water mixed with chillie powder at the police. Later the constables were treated at the parliament’s medical clinic. UNP MP Gamini Jayawickrema Perera too had chillie water thrown at his face. JVP legislator Vijitha Herath suffered a forehead injury after he was hit with a hard-cover copy of the constitution that was on speaker’s table. A copy of the standing orders were also ripped by rioting MPs. A former serjeant-at-arm Wijaya Palliyaguruge said there had never been an incident like what was seen in the chamber on Friday. He said the police had been called into the chamber to remove MPs named by the Speaker, but that had always happened after the Speaker walked out and the mace was removed. On Friday, the serjeant-at-arms could not place the mace in its designated location and was forced to hold onto it while the Speaker conducted the business of the house and had an amended no-confidence motion against Rajapaksa passed. 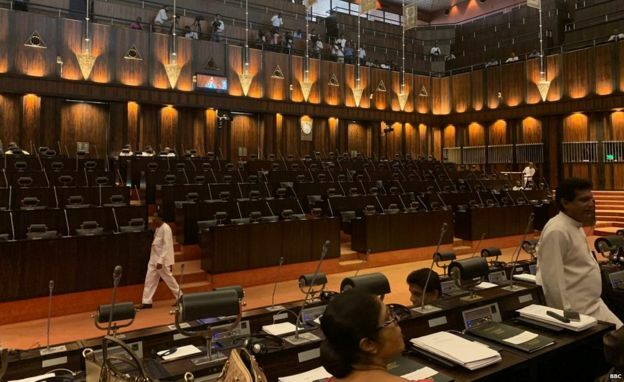 Even before the 1.30 p.m starting time, JO members had entered the chamber and were occupying the speaker’s chair and his area preventing Jayasuriya from commencing the day’s business. A senior JO member Kumar Welgama denounced the violent behaviour of his party colleagues. AFP - Sri Lanka's largest political party Saturday asked Facebook to protect the identity of its supporters, fearing a crackdown by what it called the "illegal" government. ECONOMYNEXT - Sri Lanka's finance ministry has prepared a vote-on-account to get parliamentary approval for spending in 2019, Mahinda Samarasinghe, a member of the country's disputed cabinet said amid a political crisis. The vote-on-account will seek to maintain government spending for services for up to four months, legislator Mahinda Samarasinghe said. Sri Lanka's legal draftsman had been asked to prepare the required documents. Sri Lanka's budget for 2019 was de-railed after President Maithripala suddenly appointed ex-President Mahinda Rajapaksa on October 26, plunging the country into a political and economic crisis. Rajapaksa had since suffered two votes of no-confidence in parliament and the Speaker has said a newly appointed cabinet stood dissolved and there was no Prime Minister. Ousted Prime Minister Ranil Wickremesinghe, of Sri Lanka's United National Party says he has the majority. Samarasinghe said whether or not there is a majority can be seen when the vote-on-account is presented to parliament. Wickremesinghe's United National Party has called on state officials not to follow illegal orders. Ex-Finance Minister Mangala Samaraweera claimed that Sri Lanka will not be able to repay debt without parliamentary approval after January 01. The budget law (appropriation act) when passed usually authorizes the finance ministry to borrow a certain volume of debt for deficit finance and repayment of old debt. The finance ministry said in a statement that under the specific laws under which borrowings are made, state funds can be used to settle them. Sri Lanka's central meanwhile has lost control of a peg, after cutting rates and printing tens of billions of rupees around the end of the first quarter of 2018. ECONOMYNEXT - Sri Lanka's political crisis has spread to the Bar Association with some members calling for a special general meeting to discuss a motion alleging that its President U R de Silva had violated its own constitution by publicly defending a dissolution of parliament by the country's President without prior sanction of its Council. Several parties had gone to court saying that President Maithripala Sirisena had violated Sri Lanka's constitution by dissolving parliament. Courts had issued an interim order suspending the decision. The motion was handed over to the Secretary of the Association on November 21 callin for a meeting within seven days. The members alleged that its President had breached Articles 9.1 (e) and 9.1 (b) of the BASL constitution by expressing personal opinions on a matters which required prior approval. Article 9 (e) says The President shall not express either in public or for publication or to any public authority his personal views on any matter pertaining to the objects of the Association set out in Article 2 except with the prior approval of the Executive Committee. ECONOMYNEXT - Sri Lanka’s parliament Wednesday released the official record of proceedings when two no-confidence motions were passed on the disputed government of Mahinda Rajapaksa clearing the way to mount legal challenges. The Hansards of November 14 and 16 contain the two resolutions that were passed by a voice vote of the majority in the 225-member assembly. The November 15 Hansard has the Speaker’s declaration that there is no legitimate government in the country. Official sources said the significance of the three Hansards is that it would allow any petitioner to challenge Rajapaksa as well as his disputed government in the Court of Appeal or the Supreme Court. A litigant would require proof of parliamentary proceedings before initiating action on the basis of the No Confidence Motions passed on November 14 and 16. The proceedings on Friday, the 16th, were marred by rioting. AFP - Sri Lanka's deposed prime minister secured control of a key committee in parliament Friday, dealing a blow to President Maithripala Sirisena in the latest twist in a month-long political crisis. A vote gave Ranil Wickremesinghe control of a selection committee entrusted with setting the legislative agenda in the absence of a working government. Sri Lanka has been politically paralysed since October 26 when Sirisena sacked Wickremesinghe and replaced him with divisive former president Mahinda Rajapakse. Shortly before Speaker Karu Jayasuriya took a vote by name on setting up the panel, legislators loyal to Sirisena and Rajapakse walked out of the chamber in a protest. Rajapakse has lost two no-confidence votes in the assembly, but refuses to step down. Wickremesinghe who was sacked on October 26 insists he is still in office and continues to occupy his official residence. Last week, riots broke out in the assembly with Sirisena and Rajapakse loyalists attacking rivals with chilli powder and chairs to disrupt the second no-confidence motion against Rajapakse. Two weeks after sacking Wickremesinghe, Sirisena initially suspended parliament and then dissolved it on November 9, calling snap elections for January 5. However these moves were suspended by the Supreme Court on November 13 pending an investigation. The legislature reconvened the following day but degenerated into a punch-up. For 19 days, Sri Lanka had two claimants to the prime minister's post -- but since November 15 parliament speaker Jayasuriya held that he would recognise neither. The crippling power struggle has led to a downgrade of Sri Lanka's credit rating. The authorities announced Thursday that they will halt any sovereign bond issues as international borrowing costs had shot up following a credit downgrade of the country as a result of the political crisis. ECONOMYNEXT – An overwhelming majority of MPs have challenged in the Court of Appeal the appointment of Mahinda Rajapaksa as prime minister in another twist in a power struggle that enters its second month on Monday. With the finalisation of Hansards for the stormy parliamentary sessions from November 14 to 16, a total of 122 legislators are seeking a writ or legal action requiring Rajapaksa to show by what authority he claims the office of prime minister. It has become increasingly clear that President Maithripala Sirisena had failed to muster 113 legislators, the minimum required for an absolute majority in the 225-member House, to prop up his nominee for prime minister. On Friday, the Sirisena-Rajapaksa duo suffered another humiliation in parliament when they lost control of the “selection committee” which decides on the agenda of the legislature. MPs voted 121 in favour of taking control of the selection committee by the UNP, TNA and the JVP. Unable to face a vote in the chamber, the Sirisena-Rajapaksa loyalists walked out of the chamber. United National Party (UNP) legislator Ajith Perera said the collective petition will be supported in the coming week as they have proved four times in the legislature that Sirisena and Rajapaksa did not enjoy a majority in the house. On November 5, Sirisena had announced he had lined up 113 MPs when he sacked Wickremesinghe on October 26. If that is the case, his support base appears to be declining as the power struggle enters its second month on Monday. The petitioners from the UNP, the Tamil National Alliance (TNA) and the Janatha Vikumti Peramuna (JVP) argue that following a no-confidence motion on November 14, Rajapaksa and his men cannot claim to hold any office. The Hansard of November 14 confirms the proceedings of the House when the “purported government” was defeated in a no-confidence motion. The following day’s Hansard records Speaker Karu Jayasuriya’s announcement that he does not recognise any government. Speaker Jayasuriya declared that there was no government in Sri Lanka since November 14 as President Maithripala Sirisena had failed to appoint a replacement administration. The November 16 Hansard shows the House passing another resolution expressing that it does not have any confidence in Rajapaksa dealing another devastating blow. On November 15. The House had also rejected Rajapakse’s statement to parliament which he wanted to make as prime minister, but was disallowed as the Speaker would not recognise anyone as the prime minister. Despite three votes in parliament against him, Rajapaksa refuses to step down. Ranil Wickremesinghe who was controversially sacked on October 26 also maintains that he is still prime minister and refuses to vacate the official Temple Trees residence. The JVP maintains that neither Rajapaksa nor Wickremesinghe have a right to enjoy the perquisites of the office of prime minister based on Speaker’s November 15 announcement that there is no government in the country. The latest legal challenge to Rajapaksa compounds problems for Sirisena whose November 9 gazette dissolving parliament is being challenged in the Supreme Court. A three judge-bench, headed by Chief Justice Nalin Perera, unanimously decided on November 13 to stay the sacking of the legislature and allow the petition to go ahead. Hearing begins on December 4 and a verdict is most likely on December 7. ECONOMYNEXT - Sri Lanka's disputed Prime Minister Mahinda Rajapaksa has said Sri Lanka could end up like Greece and a 'national calamity' a week after ousted Finance Minister Mangala Samaraweera made similar warning saying the country was on the brink of a Greece. Sri Lanka is in the midst of deepening political crisis after Rajapaksa was suddenly appointed as Prime Minister on October 26, that has de-stabilized debt rollover plans and a program with the International Monetary Fund. "It is now barely a month since the change of government on 26 October," Rajapaksa said in a statement. "What we have now is only an interim government. When a downward trend manifests itself, it is difficult to turn things around in a month or two." Rajapaksa said a general election will help elect a stable administration. "During this interim period, I request the people to stand by us and to participate in the effort to restore economic stability to this country," he said. "It is because of that public support that we were able to end the war that no one else was able to bring to an end. "I wish to request the people to extend to us the kind of support they gave us during the war, in order to get this country out of the economic crisis it is now in. "This is the last opportunity we have. If our effort fails, this country will end up like Greece. "We will have to work on the assumption that there is a situation of national calamity with regard to the economy." Sri Lanka however is not in a monetary union with a floating exchange rate, but a soft-pegged exchange rate regime with contradictory policy. Objectives of the October 26th change of government The text of a speech delivered by the Hon. Prime Minister Mahinda Rajapaksa at the Prime Minister’s Office on Sunday the 25th of Novermber 2018. What we did on the 26th of October was to form an interim government that would have lasted only until the conclusion of the general election that has already been declared, but temporaily put on hold by the courts. We never had any intention of running an administration through the government that has been formed at present. The whole country can see that only a few members of the Joint Opposition hold office in this government. That is because this is only an interim arrangement. I have been stressing ever since I took oaths as Prime Minister that our foremost aim was to go for an election in order to establish a stable government. However the objective of the other side is to revive the previous government and to rule the country for as long as possible without holding any election at all. That is the reason for the present political situation. Some people ask me why I accepted office when there was less than 18 months to go for the next elections. I have heard members of the UNP saying that if I had been patient for another 18 months, I could have won the ensuing election with a two thirds majority. We did not form a government to contunuously administer the country but to hold a general election. The President explained in his address to the nation that he appointed me as the Prime Minister only after things reached a stage where he had absolutely no other option. When the government is entrusted to me in such circumstances, I cannot in all fairness, shun the responsiblity. This was not a question of political power. The fate of our country and the futures of our younger generation was at stake. Furthermore if after everything was said and done, it was still we who would have to assume that responsibility anyway, there was much to be said for assuming office before further damage was inflicted upon the country. The President dissolved Parliament and paved the way for a general election. But the UNP filed action in courts and got the elections put off. If things had gone according to the gazette notification issued by the President, by now the elections authorities would have started accepting nominations. The UNP will continue to engage in disruptive activites until the Supreme Court decides whether anyone’s fundamental rights had been infringed by the declaration of a general election. The former finance minister claims that the economy is on a downward trend because of the change of government. The President invited me to take over the government precisely because of the collapse of the economy during the previous government. In such circumstances, what any democratic country would do is to hold a general election and have a new government elected to power. Because the President was in our government he knows how we handled difficult situations. We managed to find the money to fight the war. We managed to complete a large number of major development projects that no previous government had been able to get off the ground. We did not allow the people to feel the effects of the 2007 world food crisis. Even though the worst global economic recession since the 1930s took place in 2008, the people of Sri Lanka were not even aware that there was such a worldwide recession. When I assumed office as President for the first time in 2005, there was a war in the country. However the economy was not in such a bad state as it is now. At that time too, the debt to GDP ratio was 90% but the proportion of foreign currency debt was not as high as at present. I made it a point to inform the people from time to time in writing, of the foreign currency loans that the UNP government was taking through varous sources such as Sri Lanka Development Bonds, Sovereign Bonds, Syndicated Loans, Currency swaps etc, because I knew that once we were back in power, this debt burden would be the biggest problem that we would have to face. Within a period of about three and a half years, the yahapalana government had taken a total of more than UDS 20.7 Billion in foreign currency loans alone. Due to this debt burden it will take a while to turn things around. It should be plain to everyone that those who are trying to revive the previous government and rule without holding elections, are incapable of turning this country around. It was they who destroyed the stable economy that we had created. This is why they are so reluctant to hold elections. In 2006, after the war with the LTTE resumed, the people of this country, the trade unions, consumers, professionals, businessmen and all sections of the population made it a point to refrain from doing anything that would disrupt the war effort. It is because of that public support that we were able to end the war that no one else was able to bring to an end. I wish to request the people to extend to us the kind of support they gave us during the war, in order to get this country out of the economic crisis it is now in. This is the last opportunity we have. If our effort fails, this country will end up like Greece. I have to say that there is a subtle political element in these ratings as well. In 2009, immediately after the war when our credit ratings should have gone up, we were downgraded. But the markets had complete confidence in our government and no one took any notice of the downgrade. The President entrusted the country to us because he knows that we have the capacity to meet such challenges as well. The UNP too is well aware of that fact -which is why they speak to foreign journalists and diplomats on a daily basis in a campaign to convince the outside world that it is undemocratic to hold a general election. They know that if a general election is held and a government led by us comes into power, we will solve all these problems. The government that we will form together with the President will be a powerful and people oriented government. It is now barely a month since the change of government on 26 October. What we have now is only an interim government. When a downward trend manifests itself, it is difficult to turn things around in a month or two. As the general election which would have enabled the people to elect a stable government has been delayed, it will take some time for a stable government to be formed. During this interim period, I request the people to stand by us and to participate in the effort to restore economic stability to this country. The people will remember that during our period of rule between 2006 and 2014, we took every measure possble to avoid imposing heavy burdens on the people. This is why we reduced the price of fuel and some essential foodstuffs soon after assuming office on October 26. We reintroduced the fertilizer subsidy and reduced taxes on agricultural incomes so as to reduce the burden on the people and to increase production. පසුගිය ඔක්තෝබර් 26 වෙනි දින ජනාධිපති මෛත්‍රීපාල සිරිසේන, අගමැති රනිල් වික්‍රමසිංහ පදවියෙන් ඉවත්කිරීම සහ මහින්ද රාජපක්ෂ අගමැති පදවියට පත් කිරීම නීති විරෝධී යයි ප්‍රකාශ කරන මෙන් ඉල්ලා ශ්‍රේෂ්ඨාධිකරණය වෙත මූලික අයිතිවාසිකම් පෙත්සමක් ඉදිරිපත් කර තිබේ. පාර්ලිමේන්තුව විසුරුවා හැරීම, අතුරු නියෝගයෙන් අනතුරුව පාර්ලිමේන්තුව යළි රැස්කිරීම සහ මහින්ද රාජපක්ෂ දිගටම අගමැති ධුරය දැරීමට එරෙහිව මූලික අයිතිවාසිකම් පෙත්සම් ඉදිරිපත් කර තිබෙන නමුත්, අගමැතිවරයා පදවියෙන් පහකර නව අගමැතිවරයෙකු පත්කිරීම සම්බන්ධයෙන් අධිකරණයට පෙත්සමක් ඉදිරිපත් වූ පළමු වතාව මෙය වේ. සිය නීතිවේදීන් මාර්ගයෙන් පෙත්සම ඉදිරිපත් කර තිබෙන්නේ ජනාධිපතිවරයාගේ හිටපු සම්බන්ධීකරණ ලේකම්වරයෙකු සහ ජනාධිපති මාධ්‍ය අංශයේ හිටපු නියෝජ්‍ය අධ්‍යක්ෂවරයෙකු වන ඕෂල හේරත් විසිනි. පෙත්සම විභාග කොට අවසන් වනතුරු මහින්ද රාජපක්ෂ අගමැති පදවියට පත් කිරීම, එවකට පැවති කැබිනට් මණ්ඩලය විසුරුවා හැරීම, ඔක්තෝබර් 26 වෙනි දිනට පසුව "වැරදි ආකාරයට" කැබිනට් මණ්ඩලය පත් කිරීම අත්හිටුවමින් අතුරු නියෝග නිකුත්කරන මෙන් එම පෙත්සම මගින් ඉල්ලා තිබේ. එසේම, එක්සත් ජනතා නිදහස් සන්ධානය "ජාතික ආණ්ඩුවෙන්" ඉවත් වීමෙන් අනතුරුවත් රනිල් වික්‍රමසිංහ දිගටම රටේ අගමැති පදවිය දරන බව නියෝග කරන මෙන් ද පෙත්සම්කරු ශ්‍රේෂ්ඨාධිකරණයෙන් ඉල්ලා සිටියි. කතානායකවරයා ද ඇතුළුව පාර්ලිමේන්තුව නියෝජනය කරන සියලුම මන්ත්‍රීවරුන් සහ නීතිපතිවරයා පෙත්සමේ වගඋත්තරකරුවන් ලෙසින් නම් කොට තිබේ. ඔක්තෝබර් 26 වෙනි දින සිට තමන් ක්‍රියා කළේ ශ්‍රී ලංකාවේ ව්‍යවස්ථාවට අනුකූලව බව ජනාධිපති මෛත්‍රීපාල සිරිසේන රාජ්‍යතාන්ත්‍රිකයන්, එක්සත් ජාතීන්ගේ මහ ලේකම්වරයා, පොදු රාජ්‍ය මණ්ඩලයේ මහ ලේකම්වරිය සහ විදේශීය මාධ්‍ය ආයතනවලට සේවය කරන මාධ්‍යවේදීන් හමුවේ ද අවධාරණය කර තිබේ. අධිකරණය ඉදිරියේ විභාගවෙමින් පවතින්නේ පාර්ලිමේන්තුව විසුරුවා හැරීම සම්බන්ධ කරුණ පමණක් බව ද ජනාධිපතිවරයා විදේශීය මාධ්‍යවේදීන් සමග පැවසීය. විශේෂයෙන්ම ජනාධිපති මෛත්‍රීපාල සිරිසේන අගමැතිවරයා බලයෙන් පහකිරීම වැරදි බවට සමාජයේ ප්‍රබල පවතින නමුත් ජනාධිපතිවරයා මෙන්ම රනිල් වික්‍රමසිංහ සහ මහින්ද රාජපක්ෂ තිදෙනාම මේ සම්බන්ධයෙන් අධිකරණයේ මතය විමසීමට උනන්දුවක් නොදක්වන බව පෙත්සම්කාර ඕෂල හේරත් බීබීසී සිංහල සේවය සමග අදහස් දක්වමින් කියා සිටියේය. "මම මේක කළේ රටේ අනාගතය වෙනුවෙන්. මට අවශ්‍ය වුනේ මෙතෙන්දි කවුද හරි, කවුද වැරදි කියන එක වගේ ම, ඇත්තටම රටේ අගමැතිවරු දෙන්නෙක් ඉන්නවද, නැද්ද කියල ශ්‍රේෂ්ඨාධිකරණයෙන් පැහැදිලි අර්ථකතනයක් ලබාගන්න," ඔහු පැවසීය. "මොකද මේ ගැන මේ අවස්ථාවේ අධිකරණය තීන්දුවක් ලබා නොදුන්නොත් අනාගතයටත් මේක නරක පූර්වාදර්ශයක් වෙන්න පුළුවන්. එහෙම වුනොත් අලුත් මැතිවරණයකින් රනිල් වික්‍රමසිංහ තේරී පත් වුණත් ඒකත් ප්‍රතික්ෂේප කරන්න ජනාධිපතිවරයාට හැකියාව ලැබෙනවා." එක්සත් ජාතික පක්ෂය පාර්ලිමේන්තුවේ බහුතරය පෙන්වා දුන්නත්, යළිත් වරක් කිසි විටෙකත් රනිල් වික්‍රමසිංහ අගමැති පදවියට පත් නොකරන බවට ජනාධිපතිවරයා දිගින් දිගටම කරන ප්‍රකාශය ගැන අදහස් දක්වමින් ඕෂල හේරත් කියා සිටියේ, ජනාධිපතිවරයාගේ ක්‍රියාව නීති විරෝධී බවට අධිකරණය තීන්දු කළහොත් එවිට රනිල් වික්‍රමසිංහ යළිත් පත්කිරීමේ අවශ්‍යතාවක් මතු නොවන බවය. "ඒ කියන්නේ ඔක්තෝබර් 26 වෙනිදාට පෙර පැවති තත්වය පිළිගන්න ජනාධිපතිවරයාට සිද්ද වෙනව." එමෙන්ම තමන් විසින් මන්ත්‍රීවරුන් 225 දෙනාම චුදිතයන් ලෙසින් නම් කරනු ලැබ තිබෙන හෙයින්, පාර්ලිමේන්තුවේ හෝ මහ මගදී ගැටුම් ඇතිකරගනු වෙනුවට, ඔවුන් සියලු දෙනාටම අධිකරණය ඉදිරියේ කරුණු දැක්වීමට අවස්ථාවක් ලැබෙන බවත් පෙත්සම්කරු වැඩිදුරටත් පැවසීය. මේ අතර මහින්ද රාජපක්ෂට පාර්ලිමේන්තුවේ බහුතර බලය නොමැති හෙයින් ඔහුගේ පත්වීම බලරහිත කරන ලෙස ඉල්ලා ගොනු කර ඇති පෙත්සමක් සලකා බැලීම පිණිස නොවැම්බර් 30 වෙනි දින කැඳවන මෙන් අභියාචනාධිකරණය නියම කළේය. අභියාචනාධිකරණයේ සභාපති විනිසුරු ප්‍රීති පද්මන් සූරසේන සහ අර්ජුන ඔබේසේකර යන විනිසුරු මඬුල්ල එම නියෝගය කළේ එක්සත් ජාතික පක්ෂය, දෙමළ ජාතික සන්ධානය, ජනතා විමුක්ති පෙරමුණ සහ ශ්‍රී ලංකා මුස්ලිම් කොංග්‍රසයේ පාර්ලිමේන්තු මන්ත්‍රීවරු ඇතුළු පාර්ලිමේන්තු මන්ත්‍රීවරු 122 දෙනෙකු ඉදිරිපත් කළ පෙත්සමක් කැඳවනු ලැබූ අවස්ථාවේය. මේ අතර ශ්‍රේෂ්ඨාධිකරණය විසින් අත්හිටුවීමේ නියෝගයක් නිකුත් කරනු ලැබ තිබියදී, විසුරුවා හැර තිබෙන පාර්ලිමේන්තුව යළි කැඳවීමට කතානායකවරයා ගත් තීරණය නීති විරෝධී යැයි ප්‍රකාශ කරන ලෙස ඉල්ලා සිටිමින් ද ශ්‍රේෂ්ඨාධිකරණයට පෙත්සමක් ඉදිරිපත්වී තිබේ. රියර් අද්මිරාල් සරත් වීරසේකර ඉදිරිපත් කර ඇති පෙත්සමෙන් කතානායකවරයා, නීතිපතිවරයා සහ පාර්ලිමේන්තු මහ ලේකම්වරයා වගඋත්තරකරුවන් ලෙස නම් කරනු ලැබ ඇත. එක්සත් ජාතික පක්ෂය ,දෙමළ ජාතික සන්ධානය ඇතුළු දේශපාලන පක්ෂ සහ සිවිල් සංවිධාන ඉදිරිපත් කළ පෙත්සම් සලකා බැලූ ශ්‍රේෂ්ඨාධිකරණය, පාර්ලිමේන්තුව විසුරුවා හරිමින් ජනාධිපති මෛත්‍රිපාල සිරිසේන නිකුත් කර තිබූ ගැසට් නිවේදනය ක්‍රියාත්මක කිරීම අත්හිටුවමින් නියෝගයක් නිකුත් කර ඇති අවස්ථාවක, විසිරුවා හැර ඇති පාර්ලිමේන්තුව යළි රැස් කිරීමට කතානායකවරයා ගත් පියවර ව්‍යවස්ථාවට පටහැණි ක්‍රියාවක් බව සරත් වීරසේකර තම පෙත්සමේ ප්‍රකාශ කරයි. පාර්ලිමේන්තුව නොවැම්බර් 16 වෙනි දින දක්වා කල් තැබීමෙන් අනතුරුව, වහාම පාර්ලිමේන්තුව කැඳවන මෙන් දේශීය සහ ජාත්‍යන්තර වශයෙන් එල්ල වූ බලපෑම් හමුවේ ජනාධිපති මෛත්‍රීපාල සිරිසේන විසින් පාර්ලිමේන්තුව නොවැම්බර් 14 වෙනි දින කැඳවන බවට ගැසට් නිවේදනයක් නිකුත්කරනු ලැබ තිබිණ. ජනාධිපතිවරයා පසුගිය නොවැම්බර් 09 වෙනි දින පාර්ලිමේන්තුව විසුරුවා හරිමින් ගැසට් නිවේදනයක් නිකුත් කළේ ඉන් අනතුරුවය. ජනාධිපතිවරයා පාර්ලිමේන්තුව විසුරුවා හැරීම සහ ඒ සමගම ප්‍රකාශයට පත්කළ මහ මැතිවරණය පැවැත්වීම අත්හිටුවමින් පසුගිය නොවැම්බර් 13 වෙනි දින ශ්‍රේෂ්ඨාධිකරණය අතුරු නියෝග නිකුත් කළේය. පාර්ලිමේන්තුව විසුරුවා හැරීමට ජනාධිපතිවරයා ගත් තීරණය නීති විරෝධී යැයි ප්‍රකාශ කරන මෙන් ඉල්ලා ගොනු කර ඇති පෙත්සම් විභාග කිරිම පිණිස අගවිනිසුරුවරයා සත් (07) පුද්ගල විනිසුරු මඬුල්ලක් පත්කර තිබේ. අගවිනිසුරු නලීන් පෙරේරා එම විනිසුරු මඬුල්ලේ ප්‍රධානියා ලෙස කටයුතු කරන අතර, බුවනෙක අළුවිහාරේ, සිසිර ද ආබෘ, ප්‍රියන්ත ජයවර්ධන, ප්‍රසන්න ජයවර්ධන, විජිත් මළල්ගොඩ සහ මුර්දු ප්‍රනාන්දු විනිසුරුවරු එහි සෙසු සාමාජිකයින් වශයෙන් කටයුතු කරති. පසුගිය නොවැම්බර් 09 වෙනි දින ජනාධිපතිවරයා විසින් පාර්ලිමේන්තුව විසිරවීම නීති විරෝධී යැයි ප්‍රකාශ කරන මෙන් ඉල්ලා එක්සත් ජාතික පක්ෂය, දෙමළ ජාතික සන්ධානය, ජනතා විමුක්ති පෙරමුණ සහ සිවිල් සංවිධාන ඇතුළු පාර්ශ්ව ගණනාවක් විසින් ශ්‍රේෂ්ඨාධිකරණයට පෙත්සම් ගොනුකර තිබිණ. එම පෙත්සම් සියල්ල ලබන 04, 05, සහ 06 යන දිනවල විභාගයට ගැනීමට පසුගිය ඔක්තෝබර් 13 වෙනි දින නියම කළ ශ්‍රේෂ්ඨාධිකරණය, එතෙක් පාර්ලිමේන්තුව විසුරුවා හරිමින් ජනාධිපතිවරයා නිකුත් කළ ගැසට් නිවේදනය ක්‍රියාත්මක කිරිම අත්හිටුවමින් ලබන 7 වන දා දක්වා අතුරු නියෝගයක් ද නිකුත් කර තිබේ. ruwan326 wrote: Why Some Countries Are Poor and Others Rich? "සිරිසේන මහත්තයා මෙහෙම ඉන්න ඉන්න රට සම්පූර්ණයෙන්ම විනාශ වෙනවා. බහුතරය තියෙන පැත්තට දෙන්න ඕනේ." ශ්‍රී ලංකාවේ ඇතිවී තිබෙන දේශපාලන අර්බුදය පිළිබඳව අදහස් දක්වමින් කළුතර දිස්ත්‍රික් පාර්ලිමේන්තු මන්ත්‍රී කුමාර වෙල්ගම බීබීසී සිංහල සේවයට එලෙස ප්‍රකාශ කළේය. ඔහු මෙසේ පැවසුවේ අඟහරුවාදා (27) පාර්ලිමේන්තු සැසියට සහභාගි නොවීමට එක්සත් ජනතා නිදහස් සන්ධාන මන්ත්‍රීවරුන් තීරණය කිරීමෙන් අනතුරුවය. මේ සම්බන්ධයෙන් තමන්ගේ අදහස ජනාධිපතිවරයා විසින් පත් කර තිබෙන අගමැති මහින්ද රාජපක්ෂට ප්‍රකාශ කළ බව ද වෙල්ගම මන්ත්‍රීවරයා පැවසීය. "මේ සිරිසේන මහත්තයා හරි තීරණයක් ගත්තෙ නැති නිසා මේ රට සම්පූර්ණයෙන් ඉවරයි." "මම හිටිය නම් පාර්ලිමේන්තුව රැස් කරන්නෙ නෑ"
කතානායක කරු ජයසූරියගේ ප්‍රධානත්වයෙන් අඟහරුවාදා පාර්ලිමේන්තු සැසිය ආරම්භ වූ නමුත් එක්සත් ජනතා නිදහස් සන්ධාන මන්ත්‍රීවරු කතානායක කරු ජයසූරියට විරෝධය පළකරමින් සභාගැබට පැමිණීමෙන් වැළකී සිටියහ. ව්‍යවස්ථාමය වශයෙන් "ලොකු අර්බුදයක්" ඇතිවී තිබෙන බවත් පාර්ලිමේන්තුව තුළ මේ තත්ත්වය විසඳාගත නොහැකි නම්, "මහජනයා අතරට යාම හොඳම විසඳුම," බව පාර්ලිමේන්තු මන්ත්‍රී අනුර ප්‍රියදර්ශන යාපා බීබීසී සිංහල සේවයට පැවසීය. මේ අතර, තමන් කතානායක ධූරයේ කටයුතු කළේ නම් අධිකරණයේ තීන්දුව ලැබෙන තෙක් පාර්ලිමේන්තුව රැස් නොකිරීමට කටයුතු කරන බව හිටපු කතානායකවරයෙකු වනපාර්ලිමේන්තු මන්ත්‍රී චමල් රාජපක්ෂ බීබීසී සිංහල සේවය සමග සංවාදයට එක්වෙමින් ප්‍රකාශ කළේය. පාර්ලිමේන්තු සැසියට සහභාගි වූ එක්සත් ජාතික පෙරමුණ සහ දෙමළ ජාතික සන්ධානය නියෝජනය කරන මන්ත්‍රීවරු රටේ වර්තමාන දේශපාලන තත්ත්වය පිළිබඳව අදහස් දැක්වීමෙන් අනතුරුව, දේශපාලන අර්බුදය හේතුවෙන් ශ්‍රී ලංකාවේ සංචාරක කර්මාන්තයට එල්ල වී ඇති බලපෑම පිළිබඳව සභාව කල් තබන අවස්ථාවේ අදහස් දැක්වීය. පාර්ලිමේන්තුවේ හැන්සාඩ් වාර්තාව වෙනස් කළ බවට සහ කූට ලේඛන සකස් කළ බවට එක්සත් ජනතා නිදහස් සන්ධානයේ උදය ගම්මන්පිළ මන්ත්‍රීවරයා විසින් කතානායකවරයා වෙත එල්ල කර තිබුණ චෝදනාවකට ප්‍රතිචාර දක්වමින්, තමන් කිසි දිනක කූඨ වැඩ කර නොමැති අතර ඕනෑම පරීක්ෂණයකට මුහුණ දීමට තමන් සුදානම් බව කතානායක කරු ජයසූරිය ප්‍රකාශ කර සිටියේය. "යුක්තිය වෙනුවෙන් ජම්පර් අදින්න වුණොත්, ඊට මම ලෑස්තියි," යනුවෙන් ද කතානායකවරයා එහිදී ප්‍රකාශ කළේය. පාර්ලිමේන්තුවේ දී අදහස් දැක්වූ ශ්‍රී ලංකා මුස්ලිම් කොන්ග්‍රසයේ නායක රවුෆ් හකීම් වරප්‍රසාද ප්‍රශ්නයක් යොමුකරමින් කියා සිටියේ, පාර්ලිමේන්තුවේ විශ්වාස භංග යෝජනාවක් සමම්තවී ඇති අවස්ථාවක ජනමාධ්‍ය විසින් මහින්ද රාජපක්ෂ පාර්ශ්වය 'අගමැති සහ ඇමතිවරුන්' ලෙසින් හැඳින්වීම ගැන පරීක්ෂණයක් කළ යුතු බවය. මෙලෙස එම තනතුරුවලින් හැඳින්වීම වැලැක්විය යුතු බව ද මන්ත්‍රීවරයා අවධාරණය කළේය. AFP - Allies of Sri Lanka's embattled president Maithripala Sirisena boycotted parliament Tuesday as the country drifted into a second month of political turmoil. The speaker of parliament has not recognised either man -- leaving the country adrift with rival factions claiming to command a government. "We will not attend parliament until the speaker agrees to act impartially," said Nimal de Silva, an MP from Sirisena's United People's Freedom Alliance. "Usually you see opposition (parties) boycotting," Eran Wickramaratne, a Wickremesinghe loyalists, told parliament Tuesday. "But in Sri Lanka you have the unique situation where a party which claims to be the government is staying away from parliament." The ousted prime minister's United National Party plans to move a motion in parliament Friday to block any new spending by Sirisena's administration. Nov 26, 2018 (LBO) – Mahinda Rajapaksa says there is no need to hold a presidential election at this stage but only a general election. In a special statement he proposed to all political parties to agree among themselves to hold a general election to enable the people to exercise their sovereign right to elect a government of their choice. He says it is now barely a month since the change of government on 26 October and that it is difficult to turn things around in a month or two. He also added that the President invited him to take over the government because of the collapse of the economy. Rajapaksa says even though the worst global economic recession since the 1930s took place in 2008, the people of Sri Lanka were not even aware that there was such a worldwide recession. The text of a speech delivered by the Hon. Prime Minister Mahinda Rajapaksa at the Prime Minister’s Office on Sunday the 25th of Novermber 2018. Most venerable members of the Maha Sangha, Clergymen of all religions, People of Sri Lanka, and friends, In my speech in Parliament on the 15th of November, I proposed to all political parties that we agree among overselves to hold a general election to enable the people to exercise their sovereign right to elect a government of their choice. the JVP agreed but the UNP has been evasively saying that we should hold a presidential election instead of a general election. The problem is in the Parliament. Hence there is no need to hold a presidential election at this stage. No party obtained a clear majority at the general election held in August 2015. The UNP obtained 106 seats, the UPFA obtained 96. The difference was just 10 seats. A UNP led government was formed only on the basis of an agreement entered into with a group of UPFA Parliamentarians. The UPFA group left the government on the 26th October. governments were formed by the People’s Alliance in 1994, the UNP in 2001 and the UPFA in 2004.
and the futures of our younger generation was at stake. because I knew that once we were back in power, this debt burden would be the biggest problem that we would have to face. Within a period of about three and a half years, the yahapalana government had taken a total of more than UDS 20.7 Billion in foreign currency loans alone. Due to this debt burden it will take a while to turn things around. It should be plain to everyone that those who are trying to revive the previous government and rule without holding elections, are incapable of turning this country around. It was they who destroyed the stable economy that we had created. This is why they are so reluctant to hold elections. challenges. When we obtained a loan of USD 500 million from the HSBC in 2007 at the height of the war, the UNP surrounded the bank and told them not to give us that loan and if they did, the money would not be repaid under a UNP government. In April 2009 when the war was in its final stages, an IMF loan to which were were entitled as a member state was delayed. campaign to convince the outside world that it is undemocratic to hold a general election. They know that if a general election is held and a government led by us comes into power, we will solve all these problems. The government that we will form together with the President will be a powerful and people oriented government. last chance to come out of the crisis it is in. Let us all join hands to defeat the forces that seek to destroy this country by perpetuating their rule without holding elections.